Walter loves his pool. He sits under the tree all day waiting for the squirrels to come down. When it gets too hot he jumps into the pool and cools himself off. I think Walter is cute. I have a Jack Russell myself.His name is Jack for Jack Russell.Go figure.I love him so much.He is my best friend.He is the cutest sweetest most loyal dog and hes funny too.He likes to look at himself in the mirror for hours.I think hes looking at how handsome he is.lol.I think that Jack Russells are awsome.They are great company. WALTER IS MY KINDA DOG! Thanks for the great picture. Walter -- what a great name! He is a lovely broken coat. Looks smooth on his head and rougher on his backside. I love his colored half-faced too! 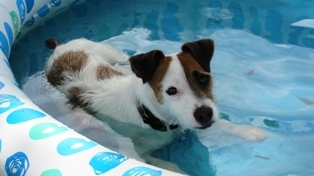 Please, consider putting Walter in for the JRT of the month. I would surely vote for him! Well, I wish I was there with Walter in the pool. Unfortunately, I'm here in Belgium until this May. Lots of rain and wind here. Have a great day in Florida and kiss Walter for us!